Have you seen Rick and Morty? It's an Adult Swim cartoon. I like it a lot, especially for Justin Roiland's improvisational voicing of its titular characters (he also plays Earl of Lemongrab on Adventure Time, if you couldn't tell). 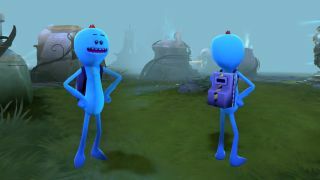 If you want to hear the pair a lot more, Adult Swim has put a Rick and Morty announcer pack up for voting on the Dota 2 Workshop, along with a Mr. Meeseeks courier. I sort of doubt they'll help your game. Full disclosure, I played video games with Justin Roiland once. Sometimes weird things happen.